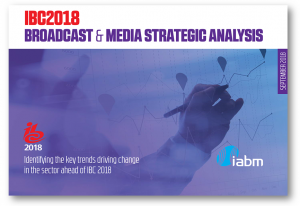 Special Report from IABM’s Business Intelligence Unit identifies key trends that are driving broadcast and media today. Our newly expanded Business Intelligence Unit has published a Strategic Industry Analysis for IBC2018 which gives an invaluable briefing on, and analysis of, the key trends that are driving change in the broadcast and media industry. The report is divided into a number of sections: an overview of the industry; drivers of change; financial indicators; demand and supply-side trends, with the latter moving increasingly to investment trends as the industry increasingly becomes a ‘media factory’; and technology adoption trackers that show the current take-up and prospects for AI, cloud, AR/VR, UHD, IP and Blockchain.